Partnered with the client team to understand the current workload for the District Manager role in order to improve the overall effectiveness of District Managers in executing the prescribed approach and operations support. Combined customer experience strategy tools and workforce optimization tools to provide quantitative and qualitative analysis through the lens of empathy. Led the Customer Experience workstream. Created a comprehensive approach to capture the current state of the District Manger workload using both qualitative and quantitative methodologies. Conducted leadership interviews and completed research of District Manager job description, training materials and work design to gain alignment on the expectations of District Managers' time. Conducted interviews with District Managers and their supervisors to capture qualitative data. Collaborated with the Workforce Optimization team to execute a work sampling study that captured quantitative data points by shadowing District Managers throughout their day and week. Merged quantitative and qualitative data to provide a complete picture of the current state. Designed and delivered A Day in the Life of a District Manager, a visual breakdown of how and where District Managers' time is allocated, to highlight variances from reality versus the desired execution of the work design. A Day in the Life of a District Manager merges quantitative and qualitative data to provide a complete picture of the current state, highlighting and summarizing the time allocation, emotional journey, and key challenges of a District Manager during a typical day and week. This document also serves as an executive-level summary to highlight critical variables that are pulling District Managers away from the recommended approach, along with key opportunities to address these variables and improve the overall effectiveness of District Managers. This document had such an impact on client leadership that it continues to be referenced regularly by client teams as an effective tool to visualize gaps between expectations and realities of the District Manager role. Partnered with a national toy retailer to support their best customers through a refactoring and simplification of their loyalty program. 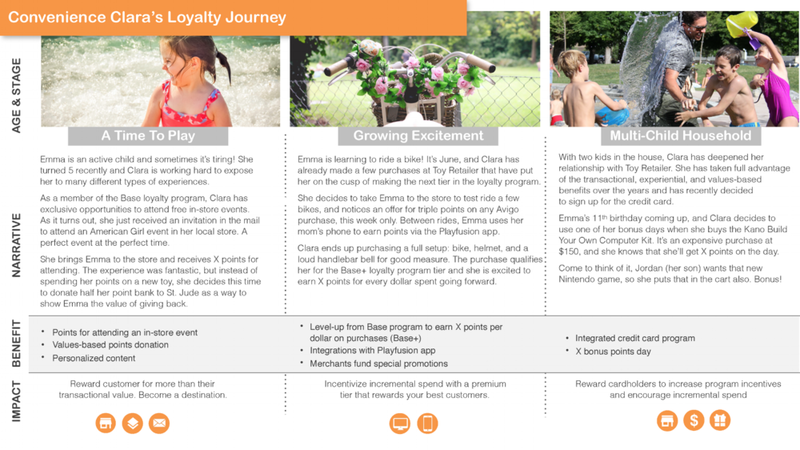 Analyzed existing loyalty research and industry best practices for loyalty programs. Reviewed current program capabilities and existing strategy documentation. Wrote the loyalty journey for one assumptive persona. In the current state, very little customer information is captured. Coached leadership to undertake a shift in strategy from an "inside-out" perspective to an customer-first "outside-in" strategy, improving loyalty by delivering value and an improved experience to customers. 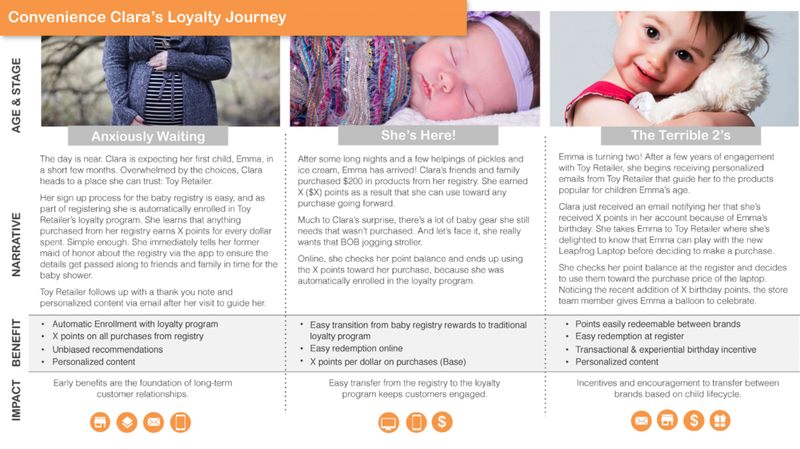 The Customer Loyalty Journey demonstrates the transactional, experiential, and values-based benefits of the proposed loyalty program for both parents and their children, while also providing a narrative that addresses key customer and internal pain points. Partnered with the client team to develop their Voice of the Customer (VoC) capability and connect their customer experience to operations. Our team assessed and benchmarked the enrollee’s current experience with the client, as compared to competitors and other industries; designed a voice of the customer (VoC) program to understand and measure customer sentiments and the effectiveness of inflight initiatives; and built a model to assess the effectiveness of the VoC program and measure ROI. Co-facilitated a two-day workshop with key client stakeholders to gather current pain points and develop customer journey maps. 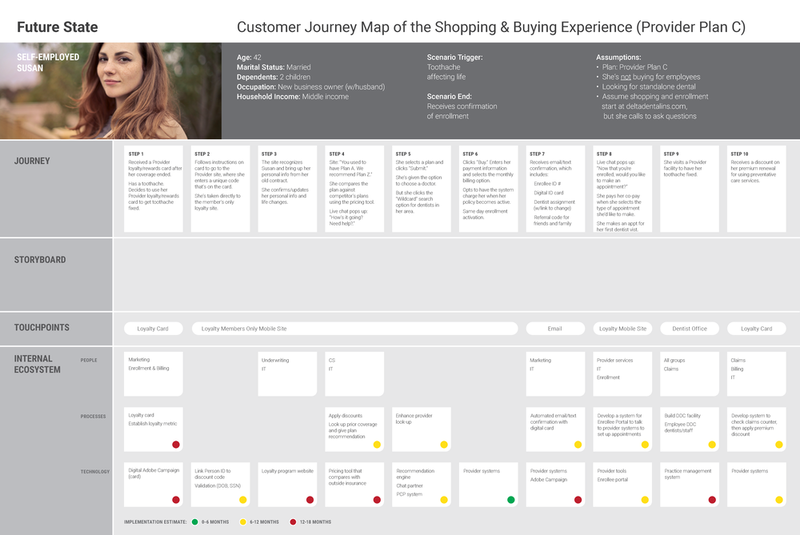 Produced poster-sized customer journey maps for each scenario (4 current state, 4 future state). Synthesized input from stakeholder interviews and customer surveys to develop 3 personas and 8 scenarios for the shopping & buying and on-boarding experiences. The Voice of the Customer (VoC) capability provides customer-driven, “outside-in” insights and turns customer data into customer understanding by planning for customer feedback to flow into and through the company in ways that inform and drive action, providing a lens through which to see progress against business goals or improvements in customer experience. Partnered with the client team to undertake the redesign of their product by refining both the functionality offered and the technology stack supporting the current portal. We collaborated closely with the client team to define a refresh to the product and to create a product vision and implementation plan to be used for future budgetary discussions. As Lead Designer, I redesigned the application (interaction and visual design using Sketch, clickable prototypes using InVision). Designed high-fidelity clickable prototypes to establish page layout, primary functionality, and workflows.Designed visual concepts as visual aids for an executive committee meeting before the project launch. Co-facilitated client workshops and conducted interviews with key stakeholders to decipher user pain points and envision the desired future state. Analyzed and synthesized user research into a persona ecosystem document that clearly delineates both MVP and MVP+ users, internal and external user roles, and user interactions with the portal and system data. 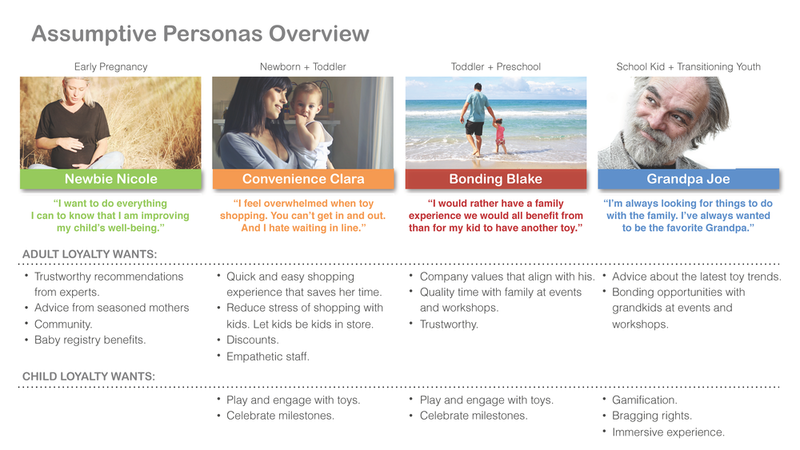 Created two detailed personas that outlined user behaviors, interactions, needs, goals, current state pain points, user requirements, and future state needs. The final executive summary deck and high-level development plan for completing future discovery and build work was leveraged by the project sponsor in budgetary discussions. Personas were used to guide UX design and user story development for MVP product launch, while the clickable prototypes were used by developers to guide the future state build, which is currently underway. The portal redesign improves usability, improves workflow, and will ultimately increase product subscriptions by making it easier for subscribers to do business using the redesigned portal. Laurel takes a great deal of pride in her design work, and in the analysis and original thinking that goes into developing design concepts and ideas. Under Laurel’s guidance, we produced some of the best deliverables I’ve seen in our 3-year history with the client.